GENEVA American cyclist Lance Armstrong was stripped of his seven Tour de France titles and banned for life by cycling's governing body Monday following a report from the U.S. Anti-Doping Agency that accused him of leading a massive doping program on his teams. Cycling's governing body agreed Monday to stripping Armstrong of his Tour de France titles, following a report from the U.S. Anti-Doping Agency that accused him of leading a massive doping program on his teams. UCI President Pat McQuaid announced that the federation accepted the USADA's report on Armstrong and would not appeal to the Court of Arbitration for Sport. The decision cleared the way for Tour de France organizers to officially remove Armstrong's name from the record books, erasing his consecutive victories from 1999-2005. 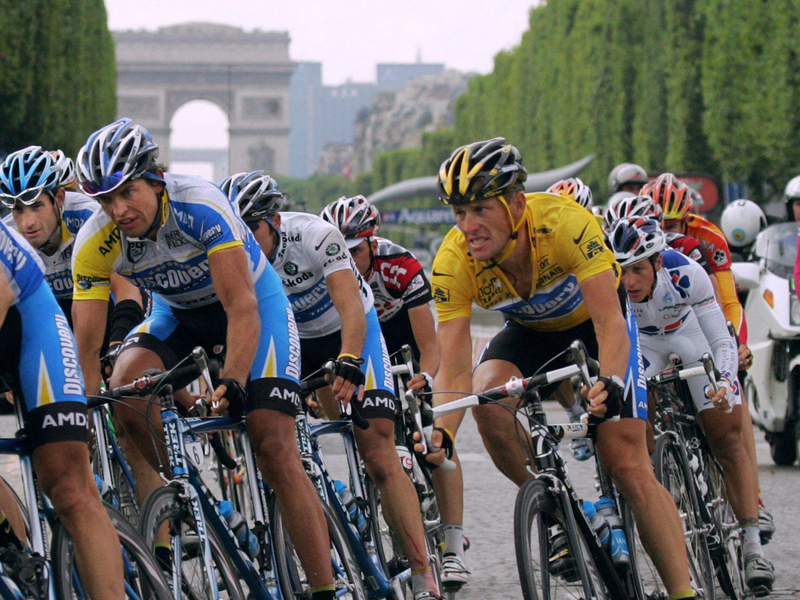 In Paris, Tour director Christian Prudhomme said at a news conference he no longer considers Armstrong the seven-time champion of the race. Prudhomme called UCI's decision "totally logical" and said "Lance Armstrong is no longer the winner of the Tour de France from 1999-2005." Prudhomme has said the race would go along with whatever cycling's governing body decided, and will have no official winners for those years. USADA said Armstrong should be banned and stripped of his Tour titles for "the most sophisticated, professionalized and successful doping program that sport has ever seen" within his U.S. Postal Service and Discovery Channel teams. Armstrong denies doping, saying he passed hundreds of drug tests. But he chose not to fight USADA in one of the agency's arbitration hearings, arguing the process was biased against him. Former Armstrong team director Johan Bruyneel is also facing doping charges, but he is challenging the USADA case in arbitration. Lance Armstrong: Last few weeks "difficult"
Nike severs ties to Armstrong "with great sadness"
While drug use allegations have followed the 41-year-old Armstrong throughout much of his career, the USADA report has badly damaged his reputation. Longtime sponsors Nike, Trek Bicycles and Anheuser-Busch have dropped him, as have other companies, and Armstrong also stepped down last week as chairman of Livestrong, the cancer awareness charity he founded 15 years ago after surviving testicular cancer which spread to his lungs and brain. Armstrong's astonishing return from life-threatening illness to the summit of cycling offered an inspirational story that transcended the sport. However, his downfall has ended "one of the most sordid chapters in sports history," USADA said in its 200-page report published two weeks ago. Armstrong has consistently argued that the USADA system was rigged against him, calling the agency's effort a "witch hunt." If Armstrong's Tour victories are not reassigned there would be a hole in the record books, marking a shift from how organizers treated similar cases in the past. The world's most famous cyclist could still face further sports sanctions and legal challenges. Armstrong could lose his 2000 Olympic time-trial bronze medal and may be targeted with civil lawsuits from ex-sponsors or even the U.S. government. In total, 26 people  including 15 riders  testified that Armstrong and his teams used and trafficked banned substances and routinely used blood transfusions. Among the witnesses were loyal sidekick George Hincapie and convicted dopers Tyler Hamilton and Floyd Landis. USADA's case also implicated Italian sports doctor Michele Ferrari, depicted as the architect of doping programs, and longtime coach and team manager Bruyneel. Ferrari  who has been targeted in an Italian prosecutor's probe  and another medical official, Dr. Luis Garcia del Moral, received lifetime bans.